Need Help With Stopping Smoking? We are not here to tell you that smoking is bad for you – you already know that. We are not here to force you to stop smoking. We are nice people and we do not force our views on others. Stopping smoking is a choice you make for yourself. What we do want to say is that there will come a time when you’ll consider stopping smoking and when you do, we want you to know that we are here for you. Please come and see us – we have a specialist stop smoking service at Ashcroft Surgery – just ask the receptionist, doctor or nurse for more advice. Did you know – if you stop smoking with a ‘Stop Smoking Support Service’ like ours, you are more likely not only to stop smoking but to remain stopped. We would like to say that we are a friendly service and we can do so much for you to help you stop. Do come in and find out more. What does smoking do to health? Smoking causes lots of problems…. It increases the likelihood of you developing lung problems and breathing difficulties (imagine, at some point when you’re older, having to use oxygen just to get up and go for a pee). It ages you quicker. Your skin will look leathery and old. By age 40, you can start looking like age 60. It causes circulation problems by clogging up the channels that supply blood to various parts of the body. In the legs, it can eventually cut of circulation so bad, that when you’re older, they may need amputating. And of course, by clogging up the arteries that supply the heart – it can cause a heart attack. In a heart attack, a part of the heart actually dies and scars over. Some people recover from this only to have heart and breathing problems thereafter. Others will die from the heart attack. Don’t ever underestimate the seriousness of a heart attack – you can get one as early as in your 30s. And what about clogging up the arteries that supply the brain – that results in a stroke, where one side of your body become paralysed and can take years to recover from (and sometimes you don’t recover at all). We all take walking, talking an picking up things for granted. What if you could not do that next week because you had a stroke? How does that leave you feeling? There are loads of other bad things smoking does but we thought we would stick to the main ones. And the risk of all of these is a lot worse if you already have a medical condition like diabetes, angina, high blood pressure and asthma. We are not trying to scare you – we are just trying to tell you exactly how it is. What makes cigarettes so deadly? Look at the diagram on the right. You’ll see that there are so many bad chemicals in cigarettes – like stuff that is in batteries, lighter fluid, toilet cleaner and lots more. 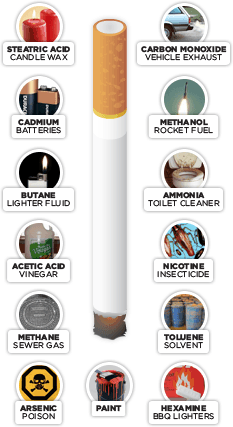 Actually, although the diagram only lists about a dozen of these chemicals, did you know that there are over a thousand chemicals in one cigarette. And these different chemicals cause different health problems. 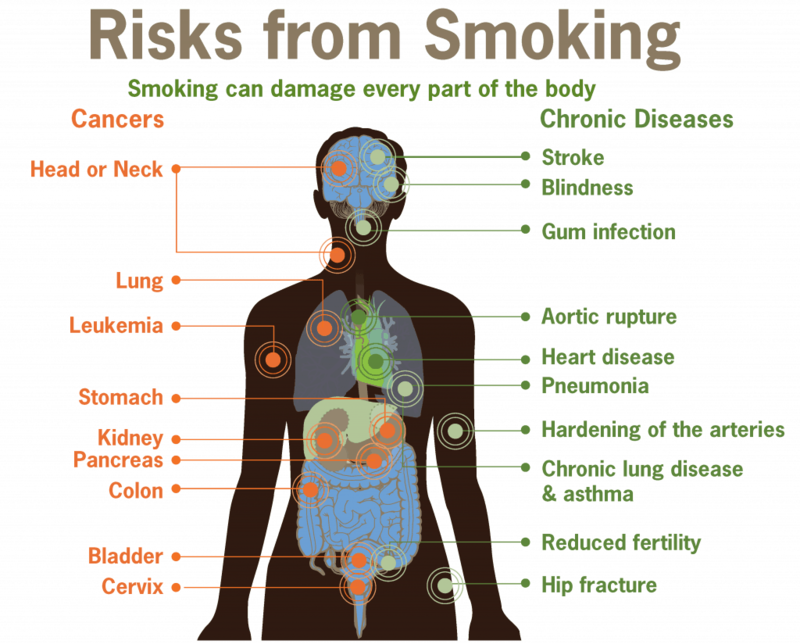 Hopefully, it should be now clear and not surprising to you why cigarettes cause so much damage to your health. But I only smoke 5 cigarettes a day. Surely that can’t be as bad as smoking 20? Smoking 5, 10 or 20 cigarettes a day – it’s really all the same! Smoking any amount of cigarettes causes damage. Remember, whether you smoke 5 or 10 – you are still thrusting your lungs to over a thousand chemicals that are present in each and every cigarette. And don’t forget the fact that your lungs are inhaling these every day. 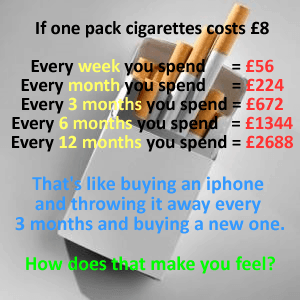 Can you see why smoking 5 or 10 every day makes no big difference – it’s all much the same. I only smoke the ‘lighter’ cigarettes. Are you telling me they’re just as bad as full strength ones? Yes! 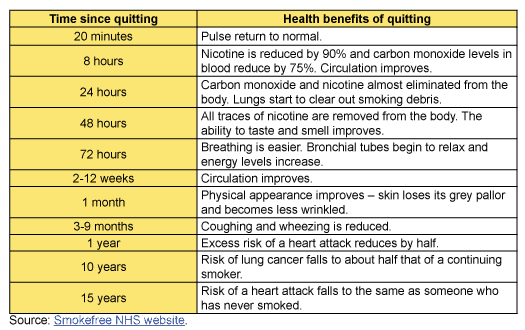 If you smoke ‘light’ cigarettes – it makes no difference, they’re just as bad as full strength cigarettes. Okay, they have less tar in them which might mean you get less problems with breathing, but your risk of cancer, heart attacks and loads of other things remains the same as someone who smokes full-strength cigarettes. And finally, smoking anything without a filter is even more bad for your health. I’m keen but I don’t want to put on weight! Not everyone who stops smoking puts on tonnes of weight. It can be controlled! Click here for more information. Did you know that if you stop smoking when you’re 30, you’re likely to live 10 years longer. Read this article by The Guardian. When’s the best age to stop smoking? The answer is quite simple – the best age to stop smoking is as young as possible. The sooner you stop smoking, the less damage it will do. After the age of 35 ish, smoking starts to do damage that is more difficult for your body to recover from. However, this is NOT to say you can smoke until age 35. The earlier you stop, the better. I’ve tried to stop before, and I couldn’t do it. The average person takes a number of goes before quitting ANY habit – be it smoking, drugs, chocolate or anything else. So – do not give up if you don’t succeed – no matter how many times you have tried. Keep trying – one of your goes will definitely work. I am 65 and I’ve been smoking for years. Surely there’s no point? Not at all! It’s never too late to stop smoking, no matter how long you have smoked for. Some things can be difficult to recover, but there’s always some recovery -your lungs will work better, even if you quit when you’re over 65. But one of the key points is that by stopping, you will stop your lungs from getting even worse. And other things – like your heart attack risk – definitely go down. Worried about withdrawal symptoms? Well – they don’t take long to disappear. Most things – only 2 weeks – and notice that not everyone will be affected. And it doesn’t take years for the benefits to show either. Only a matter of days! What do we reckon about e-cigarettes? Do you remember any of these anti-smoking commercials? HelloImAPizza (on youtube) has put together four sets which although are quite hard hitting, in all honesty – all of them spell out exactly how it is. Some of these videos may contain graphic images and themes that some viewers may find upsetting or disturbing. It’s up to you whether or not you want to hit the play button.